Sandy Klop had her first exposure to the world of colorful patterns while watching Klompen dancers perform. Every year in May her hometown of Holland, Michigan, celebrated tulip time with a vast array of Dutch costumes. She was first exposed to quilting in 1979 at her sister-in-laws when she returned from teaching in Iran. She went on to teach art in Saudi Arabia for the next four years. She loved the rich colors and patterns in the tiles and carpets of the Middle East. Back in California, Sandy began to make pattern samples for a local quilt store. From there she moved to machine quilting. She has worked at a local quilt shop and taught many quilt classes. In 2000 she published a series of quilt books with Jan Patek under the series title Folk Art Favorites before venturing out on her own as American Jane Patterns. In 2003 at Quilt Market Moda approached her to see if she would like to capture her look in fabric. She has been designing for Moda ever since. “Now I have a new fabric range from Moda every six months and I design quilt patterns to feature my new fabrics. I’m truly living my dream.” Her creative designs have appeared in several catalogs and many magazines. 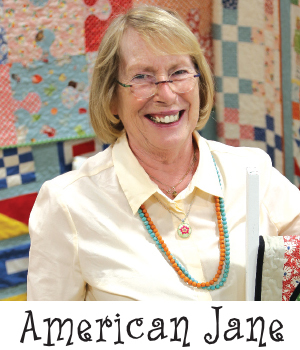 She speaks regularly on the topic, "The American Jane Story in Fabric".